Please forgive the return of the retired SU paper, but honestly -- who can not love this stuff? Its the paper that I hoard and when I get it out to use it (since I save it for "those special occasions") its retired... forgive me - but I promise ya, I will get back together and get some new paper out with projects shortly. 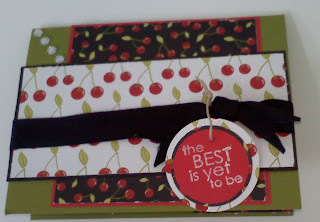 This card came together for a "Sweet 16" birthday party that my daughter was to attend. I found out she was a cherry lover, and knew "now is the time to use the good stuff"... so this is what I got for her. I also included an entire gift ensemble for her with the cherry paper included. I was proud how it all turned out. Here's a SWEET 16 going out to Marlena.. inside should have read: CHERISH THESE MOMENTS, LIFE WONT ALWAYS BEEN A BOWL OF CHERRIES! But my daughter voted for "HAPPY BIRTHDAY- HOPE ITS A SWEET ONE".